Waterloo – Opera Laurier is presenting Cendrillon by romantic French composer Jules Massenet March 8, 9 and 10 in the Theatre Auditorium on Wilfrid Laurier University’s Waterloo campus. The performances will be directed by Wilfrid Laurier University Music alumna Amanda Smith and conducted by Opera Laurier’s resident conductor Leslie De’Ath and Wilfrid Laurier University Symphony Orchestra conductor Daniel Warren. Opera Laurier’s Cendrillon reimagines the classic story of Cinderella through Massenet’s enchanting music and a modern flare to relate to contemporary audiences. "My hope is that this Cinderella story will relate to a lot of people. Rather than looking at it from a perspective of good versus evil, beautiful versus ugly or upper versus lower class, we are approaching this production with an understanding that isolation and bullying often come from social pressures to conform,” said director Amanda Smith. “To exhibit this, we set our opera in the imagination of a teenager who is bullied because she's different, but who also sees potential for belonging in a peer who seems to embrace their individuality. The world of her imagination grows increasingly fantastical and blossoms as our Cinderella gets closer to finding acceptance and, consequently, happiness." Opera Laurier, made up of Laurier voice performance students enrolled in The Practice of Opera course and current student and alumni volunteers, stages two productions a year — an evening of operatic scenes around a unifying theme in the fall term and a full production with orchestra in the winter term. Professionals work with the students as stage directors and facilitators, and students gain real-world experience by learning and practicing stagecraft, stage makeup and costuming, as well as all aspects of production from the physical set to stage management, publicity and marketing. Students will share the stage with distinguished mezzo-soprano and voice faculty member, Kimberly Barber, who will embody the role of wicked stepmother, Mme. de la Haltière. Set designer Anahita Dehbonehie created the opera’s magical setting, with lighting design by Holly Meyer-Dymny and costumes by Opera Laurier’s in-house designer, Inez Khan. Performances will take place March 8 and 9 at 7:30 p.m. and March 10 at 3 p.m. in the Theatre Auditorium. Current musicology student Bridget Ramzay will give a pre-show talk on Saturday, March 9 at 6:45 p.m. in room 106, the gallery space adjacent to the Recital Hall. 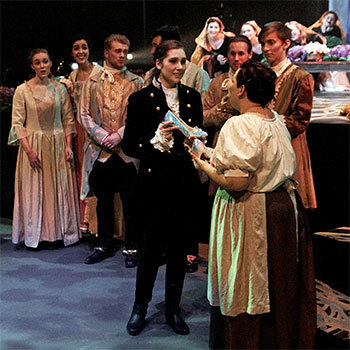 Tickets to Cendrillon are free for Laurier students, $1 for high school and elementary students, $20 for adults, and $10 for seniors and non-Laurier university students. Tickets can be purchased at the door before each performance, or in advance by emailing concerts@wlu.ca or by calling 519.884.1970 x4439. Tickets are offered online through ticketscene.ca. Members of the media are welcome to attend Opera Laurier’s rehearsals of Cendrillon, which take place the week of March 4. Email Kimberly Barber, administrative coordinator of the program, at kbarber@wlu.ca or concerts@wlu.ca for details.